After you clear the first Island Trial, wild Pokémon gain the ability to call an additional Pokémon (an ally) to its side in battle. This is called an SOS Battle. When you defeat the ally Pokémon, a new ally can be called and this can go on indefinitely. Defeating multiple allies in a row is called chaining, and making long chains increases the chance of a called ally being shiny, having high IVs, and having a Hidden Ability. The appearance of an ally also increases the amount of EVs it gives. So the more allies you defeat, the better the next ally can be. The ally is mostly of the same family as the caller. This includes pre-evolutions and evolutions of the caller. However, exceptions exist. For example, a Corsola can call Mareanie. The lower the caller’s HP, the higher the chance it will call for allies. So it is advised to lower its health as much as possible. All Pokémon have different call rates. The higher a Pokémon's call rate, the more often it will call for help. Some Pokémon do not call for allies at all. These Pokémon have a call rate of 0. A list of these Pokémon can be found at the bottom of this guide. An Adrenaline Orb increases the chance of allies being called. You can buy Adrenaline Orbs for 300P a piece as soon as you have finished Kiawe's trial, and using one is enough to increase the chance for the rest of the battle. Next to this, sending out a Pokémon with the Ability Intimidate, Pressure, or Unnerve also make it more likely for Pokémon to call for help. If the caller faints, the ally becomes the new caller. However, be aware of Pokémon that do not call for allies. If the caller faints and such a 0 call rate Pokémon remains, the chain breaks. A Pokémon with a status condition has a lower chance of calling allies. This is useful when you want to catch the Pokémon, but should be avoided while still building a chain. Some allies attack their caller. For example, Mareanie are known to eat Corsola branches. If a Corsola calls a Mareanie, the Mareanie will attack the Corsola. If the Corsola faints, the Mareanie will not call for new allies, which will break the chain. If the caller runs out of PP, it will use Struggle. This may cause it to faint eventually and if it faints without an ally, the chain will break. So make sure to regularly faint the caller before it runs out of PP, to make the ally the new caller. Find a wild Pokémon that calls the Pokémon you are looking for. This can be anywhere; in grass, in caves, while fishing, etc. Lower the caller’s health as much as possible to increase the chance of calling. Use an Adrenaline Orb to increase the chance of calling even further, or send out a Pokémon with the Ability Intimidate, Pressure, or Unnerve. During turns when no ally is called, use another Adrenaline Orb. This will not damage the caller further (you don't want it to faint) and it will not consume the Orb, it will stay in your bag. Keep defeating called allies until you have reached your goal; either finding a rare or good Pokémon, or EV-training your Pokémon. If your goal is to catch the Pokémon, inflict it with a status condition, so it has a lower chance of calling new allies, which makes catching it easier. You cannot catch a Pokémon while its ally is present. The longer the chain, the bigger your chance of having to find a Pokémon that is shiny, has a hidden Ability, or has perfect IVs. After a chain of 255, the counter goes back to 0 again. The caller calling a Pokémon that is not of the same family as the caller does not break the chain. Chaining is useful for EV-training, because a called ally doubles the amount of EVs it gives when defeated. For example, a Caterpie normally gives 1 HP EV, but a Caterpie called as an ally in battle will give 2 HP EVs. You can check a Pokémon's EVs by viewing its summary and pressing Ⓨ. If you turn on the Exp. Share, all Pokémon in your party will receive the EVs. So the Pokémon you want to train doesn’t have to be the one who defeats the called allies, and you can EV train multiple Pokémon at once this way. False Swipe, to get the caller’s HP down to 1 (except if you’re chaining a Ghost-type). Moves that cause status conditions, such as Spore or Thunder Wave. This is to lower the chance that more allies will be called when you want to catch the Pokémon. Keep in mind that some Pokémon are immune to some status conditions, because of their type or Ability. Healing moves, such as Recover or Roost. To keep your Pokémon from fainting. Heal Block, to prevent the caller from regaining HP. Imprison, to prevent certain moves from being used on your Pokémon. Worry Seed, shows which Ability the target has before changing it to Insomnia. Useful if you are chaining for a Pokémon with a certain Ability. Synchronize. If a Pokémon with Synchronize is leading the party, any wild Pokémon encountered has a 50% chance of having the same Nature as the Pokémon with this Ability. This is useful if you want a certain Nature for the Pokémon you are chaining for. For the ally to have the same Nature, the Pokémon with Synchronize has to be present in the battle each time a new ally is called. 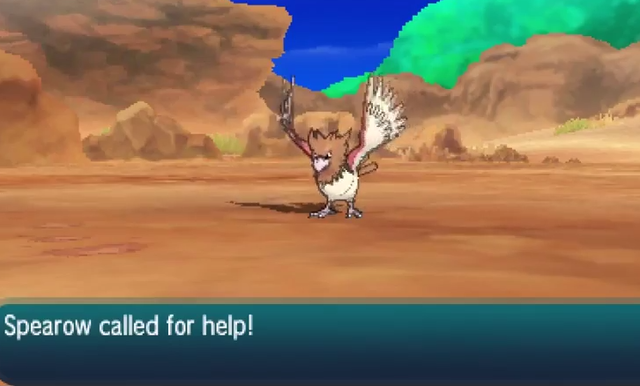 Keep in mind that Synchronize does not work in SOS Battles if the Pokémon with this Ability is fainted. Also keep in mind that Synchronize passes on status problems, which will lower the chance of a Pokémon calling new allies. Pokémon with Synchronize that can be found in Sun and Moon: the Abra line, Espeon, and Umbreon. Cute Charm. If a wild Pokémon is of the opposite gender, it can become infatuated if it hits the Pokémon with this Ability with a contact move. Useful for keeping the wild Pokémon from attacking you. Pokémon with Cute Charm that can be found in Sun and Moon: the Jigglypuff line, the Clefairy line, and Sylveon. Damp. If a Pokémon with this Ability is present in the battle, it prevents a wild Pokémon from fainting itself due to Self-Destruct or Explosion. Pokémon with Damp that can be found in Sun and Moon: the Paras line, the Psyduck line, and the Poliwag line. Pokémon with a high level of Affection have a higher chance to dodge moves and to shake off status conditions. This can be useful for keeping your Pokémon in the battle as long as possible during chaining. Learn more about raising Affection in Pokémon Refresh.